CollinsFitness Featured in The Sun, Fabulous Online Magazine. Myofascial release (or MFR) is an alternative medicine therapy that claims to treat skeletal muscle immobility and pain by relaxing contracted muscles, improving blood and lymphatic circulation, and stimulating the stretch reflex in muscles. From the Sunny rooftop of the idyllic Hotel Es Vive Ibiza CollinsFitness shows a quick start body weight HIIT guide to getting your body match ready for the year ahead. The following four body weight exercises are structured around balance, coordination, core strength and explosive power. Key building blocks to prepare your body for an optimal path to your 2017 summer body. Build up the sets to achieve a great 15 minute plus HIIT session. Run through the exercises from A to D set 1 should take around 3 - 4 minutes. Try to keep rest time to 20/30 seconds maximum at the end of each set. Progress to the next sets if you can. Add this to your morning routine HIIT, combine it with your current exercise routine or if you're a beginner try and build it into a weekly schedule and see if you can progress through the sets each week. With all exercise sessions make sure you adequately warm up and cool down. Click here to see my video with ES Online on my optimal warm up guide. A) Single Leg Dead Lift tip: trying to create a perfect T shape, lengthen through the tip of your head reach opposite standing leg away through the heel. Maintain length in spine throughout movement avoiding excess flexion (rounding spine). Breath, exhale on returning to standing position. Raise returning leg with knee as this helps to avoid hyper extending the lumber spine when coming back to upright standing position. B) Reverse Lunge Step tip: step back enough to open hip length, staying strong on your standing heel aiming to feel your glute activate on your front leg as you push through that heel to raise back up to standing position. Switch legs once you have finished the rep count. C) Core Plank Single Arm hand raises (Renegade Row) tip: lean forward in push up position with your hands shoulder width apart and under arm pits. think length in your spine and tip of your head as you maintain this posture. If you feel compaction in your wrists try bringing more weight into your feet. Keep you hips aligned with your torso avoiding hyper extension in your lower back (tail bone down braising abdominals, bum down!) breath exhaling on each hand raise control to chest and control back to floor slowly. Avoid movement in hip no swinging! D) Jump Squats tip: a soft landing is key! try not to make a noise, breath by exhaling as you push through your heels to explode into the jump. Keep feet wide in squat. Feel the glutes! This week Collins Fitness online training was also featured in the TOP 10 ONLINE TRAINING PROGRAMS in the UK!! It's been a big big week here at CF HQ this is the second national publication we've been published in one week!! Very exciting news. To see the full article click onto this link for Coach Online or grab yourself a copy from a tube station or airport! This week CollinsFitness has been featured in an article for the Telegraph online. Our online training program is based on three different levels of intensity. Starting with basic maintenance which includes 20mins video face time a month, exercise diary consultations and dietary advice through to more advanced program which includes 40 mins face time a month, plus the creation of four 20 minute bespoke exercise plans. For more information contact Collins Fitness on adrian@collinsfitness.com and get started on our personal training plan, training you in the comfort of your own living room or at your gym. To see the full article in The Telegraph and read all about our online training program as written by Deborah Cicurel click on this link. Telegraph Online Program Article. 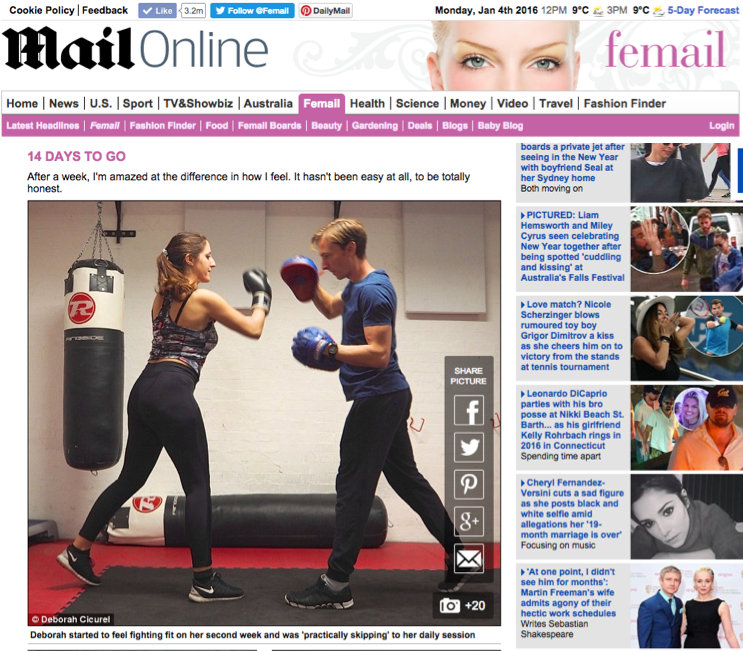 CollinsFitness was featured in The Daily Mail Online for my new Social Butterfly Program. It was a great article written by Deborah Cicurel. I trained Debbie for a period of three weeks in the busy social build up to Christmas. This was the perfect time to try out the new Social Butterfly Program as it is aimed at busy, city dwelling professionals with hectic schedules and social lives. Time was limited I only had 21 days to help Debbie transform her body in order to look svelt for her family holiday to South Africa. Her goal was to get a bikini body in three weeks. One of Debbie's favourite exercises was boxing, where she got to punish the bags at the gym and master her right hook technique. From the first week to week three Debbie made good progress in learning how to push press using her core control. Something she has struggled with at the beginning but was able to do easily by the third week. This is a fundamental exercises I train all clients to achieve. Important for shoulder stability and whole body balance. Training Debbie under such a short time frame had it's challenges. The overall result's gave her the motivation to continue on with her goals and aspirations. I would always recommend 6 to 8 weeks on the program to really see significant results. CollinsFitness featured in Sunday Times Style for the Social Butterfly Program. CollinsFitness was featured in The Sunday Times Style for my new Social Butterfly Program. It was a great article written by Michael Hennegan who is the Fashion & Lifestyle Editor. I trained Michael for a period of five weeks in the busy social build up to Christmas. This was the perfect time to try out the new Social Butterfly Program as it is aimed at busy, city dwelling professionals with hectic schedules and social lives. Keep scrolling to read the article in full. Scilly Isles Retreat coming soon. This week I'm in preparation to get the Scilly Isles retreat ready. It will be a 3 day intense program which will help detox your mind, body and soul. There will be a mix of Pilates on the beach, hiking and hill running for the more intense training sessions. There's also a great array of outdoor fitness activities to get you inspired and on track with your new regime.